If you are bound for Toronto, you’ll soon notice districts like Chinatown, Little Italy or Little Jamaica. It seems like every nation has found it’s place in the city. It goes without saying, England and France, the former colonial powers, are present everywhere. Though, if you are looking for Germans in Toronto, you need endurance. Approximately ten per cent of all Canadians have a German background. Most of the ethnic Germans live in Ontario. In Toronto they are obviously well integrated and they seem to hide their origin from public – if I want to get real German bread, I must travel to the edge of the city. Please go to fullscreen mode to watch galleries properly. German immigrants have not only shaped Toronto, they also helped to build the nation. William Moll-Berzy for example, who originates from Nördlingen, helped John Graves Simcoe to found the City of Toronto. With his German settlers, William Moll-Bercy also built a large part of Yonge Street – the longest and arguably most important street in the city. Today, Toronto accommodates several German institutions, such as the German-Canadian Chamber of Commerce, the Goethe Institute, several religious communities and one of three German Consulates General in Canada. Many German companies and financial institutions, such as Siemens, Deutsche Bank, BASF and Mercedes Benz coordinate their Canadian businesses in the GTA. This could be a good point of departure for a stable German community in Toronto. Despite that I had to search until I connected to German groups. Fortunately there are search engines and internet based social networks which help to connect the German community. There are two very active German groups at Meetup: The German Meetup Toronto and the Greater Toronto German Club. Both provide frequent events, such as a regulars’ table at a pub and an afternoon for German parents with their kids. The meetings are casual, most of the participants want to make new contacts, they look for advice or they just like conversations in German. I’ve never been to a boring meeting, met many interesting people there and became acquainted to exciting life stories. Actually the centre of the German-Canadian community is based northwest of Toronto, about one hour and a half away if you drive by car. German immigrants nestled themselves in Kitchener and Waterloo. Even today they maintain German traditions there. Kitchener boasts to have the second biggest Oktoberfest in the world. There are also several German clubs and societies which are located in this region. If you set aside the official German institutions in Toronto, most of the initiatives that promote German culture come from those two cities. Since 2000, German Pioneers Day has officially been celebrated in Ontario : Every year, one day after Thanksgiving, the accomplishments of German pioneers in Canada are honoured and German flags fly in Toronto and Kitchener. The German Pioneers Day is recognized by law in Ontario due to an initiative of Wayne Wettlaufer, resident of Kitchener and former member of the parliament of Ontario. German-Canadians in Kitchener and Waterloo have been celebrating their German origin and culture, which strengthens their identity for generations. It seems to me that this consciousness of national identity is less important for Germans that have recently arrived in Canada. It’s a pity they hide their origin – especially because many Canadians have old fashioned stereotypes in mind, if they think about Germany. I’ll report about these stereotypes in the following post. This entry was posted in All Posts, English, Germans in Canada and tagged Blog, Canada, Eike Schamburek, English, Featured, Germans, Ontario, Toronto on December 18, 2013 by Eike. At first glance, Toronto seems to be rather grey – especially because of the traffic which rolls continuously through it’s streets. At second glance you can see, Toronto also provides a lot of green spaces. Please go to fullscreen mode to watch gallery properly. The first time I arrived in Toronto I was shocked: The city didn’t meet the expectations I had of Canada. The highway upon which we entered the city had twelve lanes of traffic and the skyline, made of glass, chrome and cement, was twinkling aggressively in the evening sun. We drove several kilometres on Yonge Street, passing apartment blocks, pubs and hundreds of small shops. We live on Yonge Street and the traffic flows in front of our windows 24 hours a day. After living here for three months I still haven’t adjusted to the noise and the dust the cars produce. Fortunately, from here it’s just a few steps to the next green and quiet spots. Even if it’s not obvious at first glance, nature has a significant value in Toronto. Almost forty per cent of the city is covered with trees, bushes and grass. Many of the side streets lead in shady residential areas, with gardens and trees growing in front of the houses. This concept shapes Toronto: The main streets are busy, and the traffic flows as slowly as molasses. Indeed, if you turn onto a side street you find yourself in a quiet residential area with small houses, gardens and trees along the street. Unfortunately, to live there you must have a good salary. In some fancier areas, such as Rosedale which is around the corner, a modest house costs at least a million dollars. The city left streams, rivers and ravines to their own resources or recultivated them. A few steps from our apartment there is a trail that leads to a ravine. If I walk down there, the big city is out of sight and out of sound – it feels like I am walking in the German Black Forest. After walking for an hour, I arrive at the Don River Valley which leads down to the lakeshore. Both big rivers in Toronto, the Don River and the Humber River, flow through the heart of the city, embedded in green valleys. Along the river beds grow trees like the Staghorn Sumac, a native tree which is well known for it’s beautiful ruby colored blossoms. The water of the Humber River is clear and families picnic at the river’s shore. There’s also the opportunity to rent a canoe to paddle down to the lake. Lake Ontario is a destination for people who need a break from the big city’s rush. Bike trails and boardwalks go along the shore for kilometers. If you don’t have your own yacht or sailboat in the harbour, you can also explore the coastline with a rented sea kayak. Many people expect Lake Ontario is very dirty and polluted by the city’s waste and sewage water. Toronto’s beaches are actually awarded with Blue Flags – an international standard for cleanliness and sustainable management. Some days ago the Canadian newspaper Globe and Mail published an article saying fishing at the Toronto’s harbourfront is healthy and you can catch proper sport fish. However, not everybody is convinced: a friend of mine told me he noticed a lot of garbage on the when he was swimming at the Islands. Toronto has many public parks. High Park, in the west end, is one of the most beautiful. It has almost 160 hectares and extends down to the lake. Besides many playgrounds and recreation facilities, the park has a small zoo and in summer theatre lovers visit the High Park Amphitheatre, where performances take place in the evening. In my opinion, the green highlights of the city are the Tommy Thompson Park and the Toronto Islands. Actually at Tommy Thompson Park trucks unloaded stones, diggings and rubble for decades. Over the years a small peninsula developed on which rare plants, birds, butterflies, snakes and rabbits found a new home. Today it is called “Toronto’s urban wilderness”. Nowhere in Toronto live more birds than in Tommy Thompson Park. It is said that about 300 different bird species visit the peninsula every year, some of them stay the whole year. If I bike down the park – one of my favourite routes ends there – I startle finks and Canadian geese that glance at me with irritation. The Islands are a popular place of family excursions, I’ll write about them in detail in a following post. This entry was posted in All Posts, English, Toronto and tagged Blog, Canada, Eike Schamburek, English, German, Kanada, Ravines, Report, Toronto, Trees on October 14, 2013 by Eike. In some areas of Canada there live more moose than men. There are plains so huge and flat that they bend in the horizon and villages whose residents still live off hunting and fishing. These are the images which formed my vision of Canada before I left Germany – images produced by documentaries and nature magazines, images of dreams in my childhood. But, of course, Canada is much more. I live here now and I’ll delve in this country, its culture, society and nature. I keep these impressions in my blog for my friends, my family and my former coworkers in Nuremberg because I want to share my experiences with them. During the first weeks some topics took shape already: There’s Toronto, the biggest and in my opinion most vivid city in Canada, the city in which I now live. Toronto is a bridgehead of the country: Here arrive immigrants, adventuresome tourists and work-seekers from around the world. Many of them have been laying down roots and they shape the city with their food, celebrations and traditions. In the beginning it was a bit strange for me to be constantly surrounded by people of different skin colours and nationalities – even if I have lived in several big european cities. After just a few weeks it is now normal for me to have supper in a Mexican or Ethiopian restaurant, to slurp a pho in Chinatown or to sip an espresso in Little Italy. The variety of food in Toronto alone offers inspirations to write a series of books. If you arrive in Toronto, you first notice the huge office towers and living hives. In this place Toronto appears to be busy, plain and grey. The money rules here. But someone who delves more deeply into districts and nightlife quickly realizes: Toronto, in its diversity, is barely penetrable. The city is a huge, colourful, pulsing organism. Canada has been a dreamland since my youth. We spread out a map of North America in front of us and envisioned where we want to built our log house – it was thought to be deep in the wilderness, with moose as our neighbours. If somebody in Germany thinks about Canada, they visualize romantic wilderness, impenetrable forests, crystal clear streams and bears fishing for salmon. For many Germans who are tired of the fast-paced modern life and have dreams of going off-grid, Canada is a canvas for projections of their yearnings. Of course reality is much more complex: In many places the Canadian wilderness still exists, with all it’s amazing diversity of plants and animals. 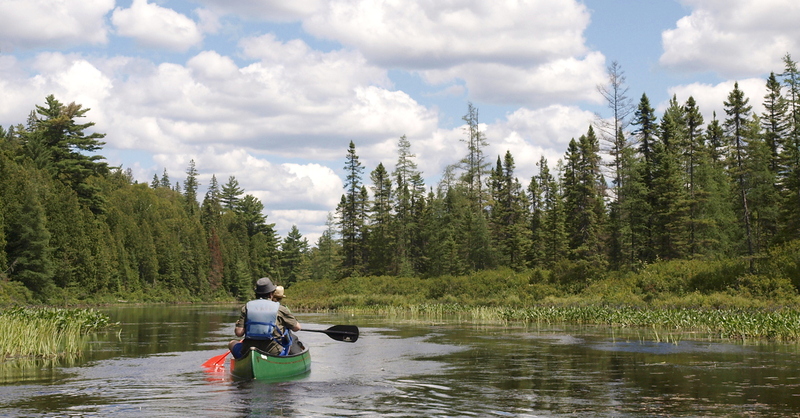 And nature is consequently conserved in national and provincial parks, such as the Algonquin Park in Ontario. In other places there isn’t much left of the country’s primordial beauty. There, nature serves as a seemingly inexhaustible supplier of resources. In comparison to Germany, Canada is unbelievably rich in natural resources. Beneath the wood and croplands, the country provides metals, uranium, gas and oil. The mining industry is shaping swaths of land. Not everybody likes that. Highly controversial is the mining of tar sands in Alberta. Aerial images show large mine dumps and, in the the sunlight dazzle colourful lakes, in which oil is washed out with toxic solvents. I am a German with a very strong sense of nature and such images raise my hackles. But, i also recognize that the oil industry is extremely important for the Canadian economy. It creates thousands of jobs and it provides wealth in regions which would be economically weak without these resources. If you want to work in places with names like “Fire Bag” and if you want to live there in mobile containers, then it’s a good opportunity to make a killing. In this blog I am going to talk about the European image of aborigines as well. It’s a very sensitive topic here: Just the expression “Indian” – that is still used in Germany for North American natives – could cost me my head. In Canada it is considered a racist and contemptuous expression. At least 1.5 millions aborigines live in Canadian cities and on 860 reserves. They talk in 65 different languages and dialects. In contrast to the USA, aborigines have a special status in Canada, receiving economical, political and intellectual support. Canadian writers, such as Joseph Boyden, bring native history, traditions and spirituality back to mind. Canadian aborigines continue to be discriminated and exploited, even until today they must fight for acceptance. Of course I will also report about issues I meet in daily life and I will examine current events – for example incidents like the terrible train accident in Lac Megantic and the floods in Toronto in July. This entry was posted in All Posts, English, Into the Wild and tagged Blog, Canada, Eike Schamburek, English, Report on August 14, 2013 by Eike. Marcos Abenteuer in Kanada Der gebürtige Berliner Marco berichtet über seine Abenteuer und gibt Tipps für Reisen in Kanada. Bilder mit Geschichte Drei Jahre hat Anna in Bolivien und Brasilien gelebt. Lateinamerika, Europa oder jeder andere Kontinent: Hinter Begegnungen mit unterschiedlichen Menschen verbirgt sich oft eine große Geschichte, die Anna mit Fotos und Texten aufbereitet. Miri rockt Kanada Studentin Miri kommt ursprünglich aus Chemnitz. Sie hat für vier Monate in Toronto gelebt und in ihrem Blog über ihre Abenteuer in Kanada berichtet. Spass am Dienstag – die Seite mit Mac Infos, Links und Tests zu Mac, Apple und Co.
parallel.universal Stefan bloggt über das aktuelle Geschehen – aus Nürnberg, über die Gesellschaft, für die Menschen. Koerbus Blog Fernsehen für das innere Auge: Koerbus bloggt über Literatur und er schreibt selbst Literatursplitter. Wollfisch Sara berichtet süffisant über Alltägliches, Menschen, Dinge und Geschehnisse.